So you could have water front property on Mars in the near future. Joking aside, we have all seen what scientist have held up as evidence of water on mars over and over only to see it fall on its face. The particular location they show numbered 4,5, and 6 and are colored in blue does look like it was formed by water flowing, unlike all the other things they use as evidence of water. Ultimately, if you look at the complete picture here: http://www.google.com/mars/ you will see that the lake like formation has a link to the valles marineris (which I am sure is why they believe the valles marineris to be formed by water and not a huge discharge as illustrated by Wal Thornhill http://www.holoscience.com/news.php?article=rnde0zza) So, I imagine it is my limited understanded and knowledge which prevents me from seeing the structures they show numbered 4,5, and 6 and are colored in blue, to be anything other than water but I don't know any other explanation. All that I have seen here and understand is that water makes the smooth flowing lines we find in this case and not the rough 60 to 90 degree bends and hard edges we find in valles marineris, for example. If you looke at the craters in the blue section towards the poles it looks like water has flowed around them just like putting a bolder in a small stream. Of course the other problem is that, in this case, the water would be flowing towards the pole. Could some of you please help me to understand and make sense of this. thanks! Last edited by nick c on Sun Mar 27, 2011 7:57 pm, edited 1 time in total. This has to be one of the most subtle and greatest Google April Fool's day jokes I've seen! Never trust Google on April 1st... Ever! That still does not help my confusion as to how these features were formed on mars as they do appear to be formed by water. Ion01 wrote: That still does not help my confusion as to how these features were formed on mars as they do appear to be formed by water. We see the exact same stubby-ending, steep-walled features as Valles Marineris itself. And those features share the exact same "coastline" or border as the section ascribed to "fluids." Notice that in the latter of the two links above in "IR"/"visible" mode: you also get channels branching at right angles to one another, then abruptly terminating. The former of the two links above ("infrared") also displays extremely apparent bifurcating / branching patterns. Are we to believe that this long thin channel with branches at right angles was ALSO carved by fluid erosion? I find it highly unlikely. Is it consistent with fluids, or perhaps with something closer to a corona discharge or sheet discharge? A la intimations about Europa. Not saying that's necessarily "the" answer, but an interesting question. One is tempted to point out the question of which direction the water would be purported to flow in? From the SW to the NE, or vice versa? One would ASSUME it would flow down hill...? IE, SW to NE. But, then how does the "bifurcating" / "branching" configuration mentioned earlier form if it was created solely through fluid erosion? And why would it start in the particular areas it does? it seems to be in the middle of the much larger feature, and might have been at the bottom of a river or some such. One wouldn't expect that feature to show up right there? Fluids seem to just create more questions than answers, when taking the specific features into mind. Speaking of which, would a river or sea be expected to create such steep walls to begin with? Or would it have generally a much more subtle "shoreline?" I see a fuzzzy area around the dark feature in center image, and what looks like a plasma curtain going up the face of the cliff at the left side of the dark area. And what about some of those features to the left of the cliff face, on the slopes of those sandy colored ridges? I'm wondering now if the recent image of a 'landslide' caught in action on mars wasn't a similar thing. What else could I be seeing? Thanks for the info! The key I was really looking for was found in the link here: http://www.thunderbolts.info/tpod/2005/arch05/051214europa.htm which you referenced. Basically it helps to explain the smooth slowing fluid like pattern which is what I had a hard time explaining. I have a very good understanding of this EU but there is so much evidence and information on EU that it is gets really difficult to get everything together sometimes. Thanks so much for your help. I've read many papers that deal with supposed water features on Mars, I've read none that deal with the erosionary effects of water under 0.6g. I haven't read anything regarding the erosionary effect of a global dust storm "raining" out of the atmosphere either. I would be interested in reading how the tenuous Martian atmosphere, at <1% density of Earth's atmosphere, can generate mountain sized dust devils and planet wide dust storms when the only mechanism under consideration is solar heating. Also, note that EU doesn't preclude the possibility of water, in some form, past or present on Mars. Only that, most of the features conventionally attributed to the action of water, have better electrical explanations. Upon closer inspection of the dendritic ridges in Hebes Chasma via the photos at the ESA site; I'm stunned. Especially around the perimeter of the central "flat-topped mountain". That is amazing. Wasn't quite sure where to put this, but hopefully it's not too far off-topic. As a virtually non-contributing lurker here (but a keen non-expert enthusiast) I'd like to say how much I appreciate the truly insightful, logical and 'testable' TPOD analyses, as compared to the conventional gas-light-era doctrines that currently prevail in 'expertdom'. In contrast to TPOD: Although I love the often-stunning APOD graphics I receive daily, the accompanying dogma-tainted' interpretations' offered by APOD usually leave me drumming my fingers and groaning in utter disbelief at the closed-minded foolishness of 'educated' 21st-century professionals. 'If I ruled the world' I would ensure that each and every puzzled and mystified (or baseless but confidently assertive) APOD summary was accompanied by the appropriate alternate EU explanation for all to compare - and to open up discussion and deeper analysis of those curious and all-important anomalous details. I'm serious actually. Maybe something could be done. APOD delivers so many marvellous revelations - negated by such obviously absurd explanations. A daily EU commentary to counter and correct the routing APOD misinterpretations would be most desirable. Hard to match the deep pockets of the 'status quo' though. Here is just one recent pathetic APOD explanation picked from a multitude, which DEMANDS discussion and deeper enquiry: "Defrosting ice-dunes" - there for all to see, and each "ice-dune" neatly date-stamped with the company logo! But what's REALLY happening? Is the APOD interpretation empirically based on observation, such as the way ice thaws - with neatly imprinted insignia - on earth, and elsewhere? 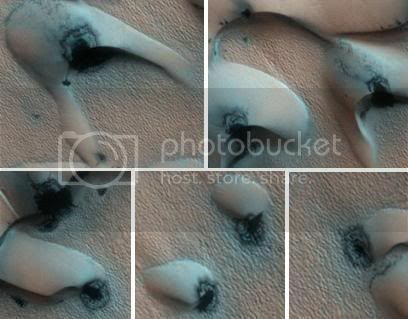 Explanation: What are these strange shapes on Mars? Defrosting sand dunes. As spring now dawns on the Northern Hemisphere of Mars, dunes of sand near the pole, as pictured above, are beginning to thaw. The carbon dioxide and water ice actually sublime in the thin atmosphere directly to gas. Thinner regions of ice typically defrost first revealing sand whose darkness soaks in sunlight and accelerates the thaw. The process might even involve sandy jets exploding through the thinning ice. By summer, spots will expand to encompass the entire dunes. The Martian North Pole is ringed by many similar fields of barchan sand dunes, whose strange, smooth arcs are shaped by persistent Martian winds. Explanation: The largest canyon in the Solar System cuts a wide swath across the face of Mars. Named Valles Marineris, the grand valley extends over 3,000 kilometers long, spans as much as 600 kilometers across, and delves as much as 8 kilometers deep. By comparison, the Earth's Grand Canyon in Arizona, USA is 800 kilometers long, 30 kilometers across, and 1.8 kilometers deep. The origin of the Valles Marineris remains unknown, although a leading hypothesis holds that it started as a crack billions of years ago as the planet cooled. Recently, several geologic processes have been identified in the canyon. The above mosaic was created from over 100 images of Mars taken by Viking Orbiters in the 1970s. I'm not buying the idea these Martian features were created by flowing water. First: where was the source of the water? Second: where did the water flow to? 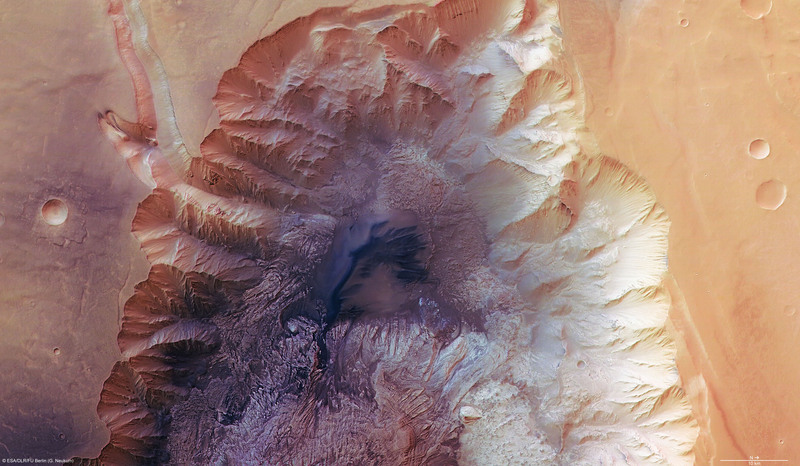 Echus Chasma seems to end with no apparent river "mouth" or delta. Third: why does the Chasma's floor appear flat? Fourth: why are the Chasma's walls (at least in the first and third photos) so smooth, as if scooped out of the ground instead of eroded? Fifth: where are the dunes or deposits of sand from those huge Martian storms? The Chasma looks too new. Sixth: maybe my eyes deceive me, but why do the "tributary" channels that join the Chasma seem mostly to do so at angles close to ninety degrees? Was it really "water" that made those phyllosilicates? Water everywhere in our Solar system, recently! As we did hear from Mercury, our Moon and lately in some new abstracts about Mars, it seems to be full of water. But as we have found out in the case of Mercury already it is not "water" as we might be made to believe, but signs of water, so all kind of hydroxile groups and ions as H2O+, H-, or O+ that may form or contribute to water. What most of our astroscientists don´t seem to recognize are those clearly visible Lichtenberg-figures that we see at the end of almost each of those "offsprings" that form the Echus valley! So again, it could be very likely that NASA is mixing up cause and symptom again, as from the electrical point of view the valley would have been formed from within and as the twisted main filaments of the plasma discharge move away from the point of first contact with Mars´s surface, they all at sudden stop their "digging" and disperse in a typical patterns of Lichtenberg branches as the current gets weaker. 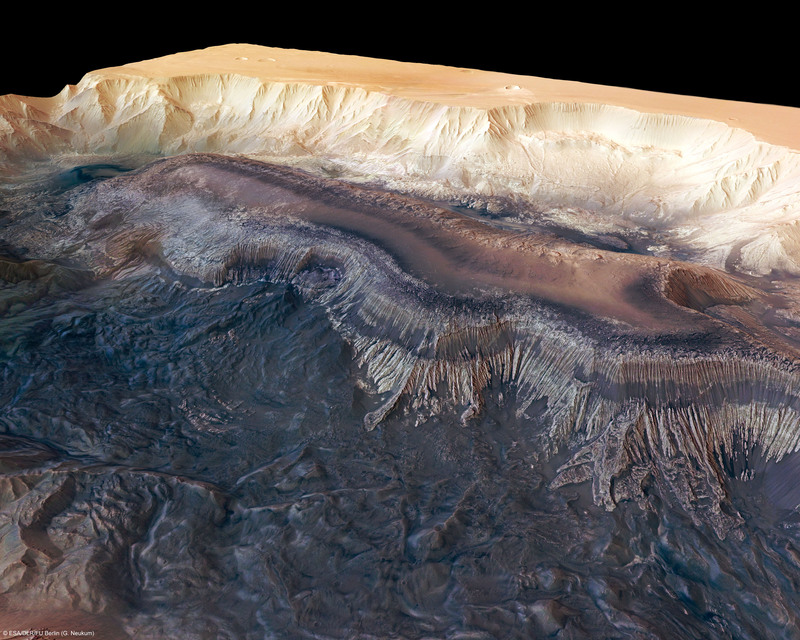 The High-Resolution Stereo Camera on ESA’s Mars Express has returned all these impressive images of Echus Chasma. As we know from a similar - but much bigger - formation nearby in the south, the Valles Marineris all this can be explained rather conclusive with electricity likewise, and while the first abstract speaks of really phantastic timespans of "4.6 to 3.8 billion years" we should be aware that the same effects could be achived with electrity, again - in a much shorter timeframe. You see, they aren´t quite sure themselves about what they are stating as it seems likely unscientific that abundant water existed on Mars, while our Earth was still in the process of just being formed.